The midsize Hummer H3 is now its most popular model due to its relatively reasonable price and compact dimensions. Hummer now adds a H3T 4-door pickup variant with a 5-ft. cargo bed. Engine choices include a 242-bhp 3.7L I-5, or a 300-bhp 5.3L V-8. The 3.7L is available with a 5-speed manual or a 4-speed automatic, while the V-8 gets only automatic transmission. Maximum payload is 1,150 lbs. (I-5) and rated towing capacity is 5,900 lbs. (V-8). Hummer must have serious off-road capabilities, so the H3T can climb a 60% grade, traverse a 40% slope and has up to 10.2" of ground clearance. Hill Hold Assist is standard and front and rear locking differentials are available. The standard Z85 suspension is designed for highway and off-road driving, while the Off-Road Adventure suspension is for dedicated off-road travel. All H3 and H3T models can be flat-towed if required. Options include a navigation system and rearview camera. According to Hummer, the H3T is intended to compete against the Toyota Tacoma, Nissan Frontier, and Dodge Dakota. 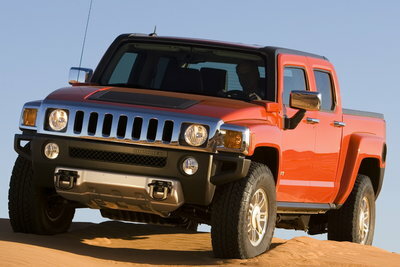 Hummer's H3 adds a truck model for 2009. The 4-door H3T offers Hummer styling and a five-foot truck bed. Engine choices mirror that of the H3 SUV including a 3.7L inline five-cylinder and a 5.3L V8.